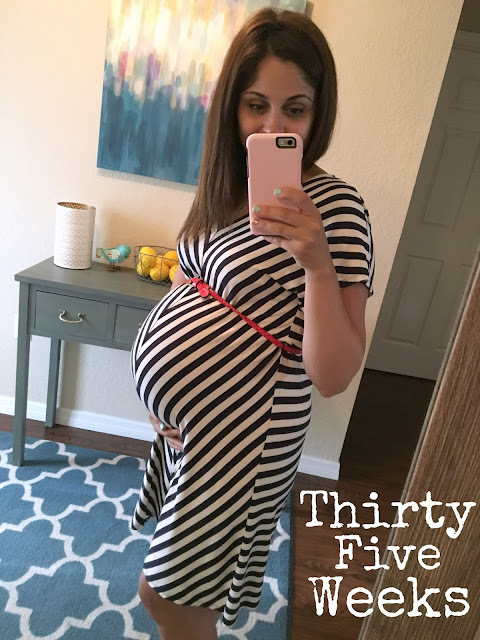 THIRTY FIVE weeks! People keep telling me I look small, but I sure feel GIANT this week! Baby Girl is the size of a bunch of carrots, which is a weak comparison. I looked up alternatives and decided that a pineapple is way more fun to say! I'm not sure how much weight I've gained, it's not like I weigh myself often....and I just ate a donut so it will have to wait until next week! I'd be willing to bet it's at least two more pounds since I last checked a week ago. My belly is rounding out a lot more and baby is starting to drop! The pressure on my pelvis is getting intense, but not enough to alleviate the squishing of my lungs. I feel full all the time, even when I'm hungry. Does that make sense? It doesn't to me either, but it's the only way to describe it! Here's another thing that makes no sense. Even though I'm waking up anywhere between 4 and 7 times during the night to pee....I'm still sleeping well. I'm as comfortable as I can be at this stage and falling back to sleep is never a problem. That's probably because I'm exhausted and working like a dog. Everyone keeps telling me to "take it easy" but there is sooooo much to be done at the beginning of the school year it's impossible to do any such thing. I'm nesting....at work. Somehow I need to really make a switch and nest at home because it is time! I swear I'll have that hospital bag packed tomorrow for real. I've been talking about it for weeks now! My girl is moving around so much in there but instead of being quick, fluid kicks and jabs, it's more like slow stretching and rolling around. It's so weird, and feels like she's bruising me in a few spots. She's such a strong little lady! My work wardrobe is limited, even my maternity clothes are getting tight and uncomfortable. My khaki capris are not long for this world. I may wear them one more time but with a long shirt, juuuuust in case. It looks like the seam is about to give. I have a pair in blue and black, so now I'm scared! I have about 3(ish) weeks left of work, so it's going to have to stretch...literally! Thursday was the first day of school. I wore the same dress as I did on the first day of school when I was pregnant with Ella. Remember, I'm on the exact same track as I was since my due dates are only 1 day apart. Look how much smaller that belly looked 3 years ago! I'm thinking Sko Dos is going to be at least a 7 pounder (Ella was 5 lbs. 13 oz.)! Calling it now! Three days ago I said at least 6...as the days go by, my "guesstimates" are increasing! Here's a (ridiculous) pic I took about an hour ago, before the donut. Tomorrow is 36 weeks, that's nuts! Less than a month until my due date...it's almost time to meet Sissy! 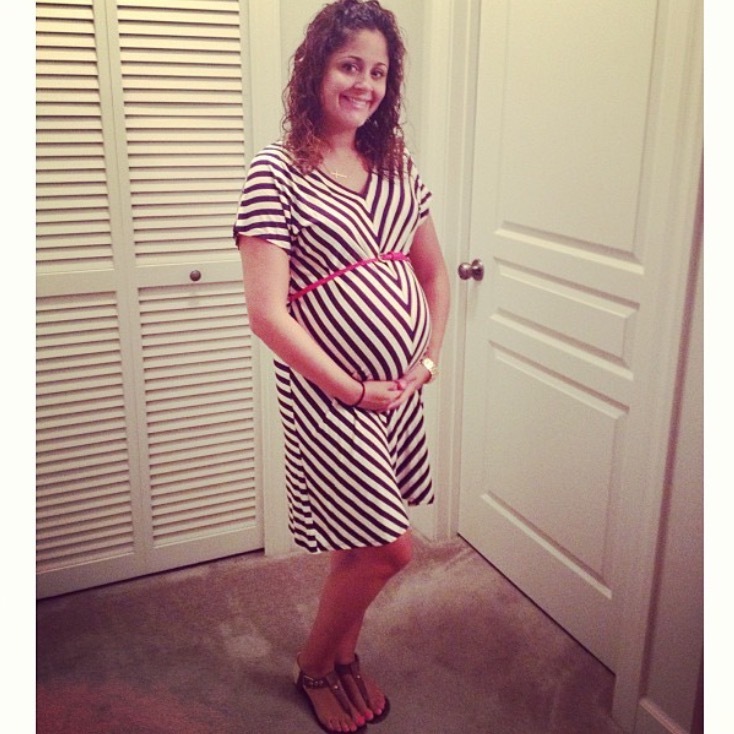 Click HERE to check out 35 weeks with Ella Rose!